Definition of sustainable development was released in the report ‘Our Common Future’ in 1987 by the World Commission on Environment and Development (chaired by Gro Harlem Brundtland). According to the report “Sustainable development is development that meets the needs of the present without compromising the ability of future generations to meet their own needs”. As it is obvious based on the above with only painting a kindergarten’s fence a company does a very little for sustainability. In the same way donations for non-governmental organisation is not equal with CSR, neithert with sustainability, as it is just the part of it. These are small and even important steps, but they are not an reflecting a responsible overall operation and strategy integrated by the whole corporation. The company which operates resulting environmental damages, but in the meantime provides bountiful donations for green NGO-s, environmental programs, is the good example for green washing. In this example it is very possible that the companie’s benefit arising from environmental damage is much bigger than its costs on philantrophy. 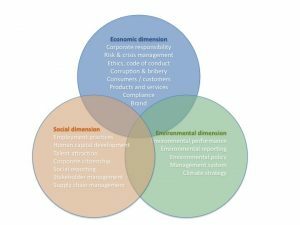 To corporate sustainability such applied theories contribute like sustainable development, corporate social responsibility (CSR), stakeholder theory and accountability. Corporate sustainability is a very complex, overall company-wide strategic and operational process. It can not be established from one day to other, but if there is a real intention, then step by step, with persistent work, it can create a long-term value for not just the company, but also for the society.